In Craycraft's book on Baluch prayer rugs he also mentions the rosette border. In addition he says that two cords wrapped together is a characteristic trait of the selvage. I'll have to review what I have looking for that border. In the meantime, here's another balisht. I had it cataloged as a mat, but then changed my opinion and only recently updated the entry. The weaving is very nicely done, and the dyes are quite pleasant. The green is very difficult to see in the first image. Asym open left. 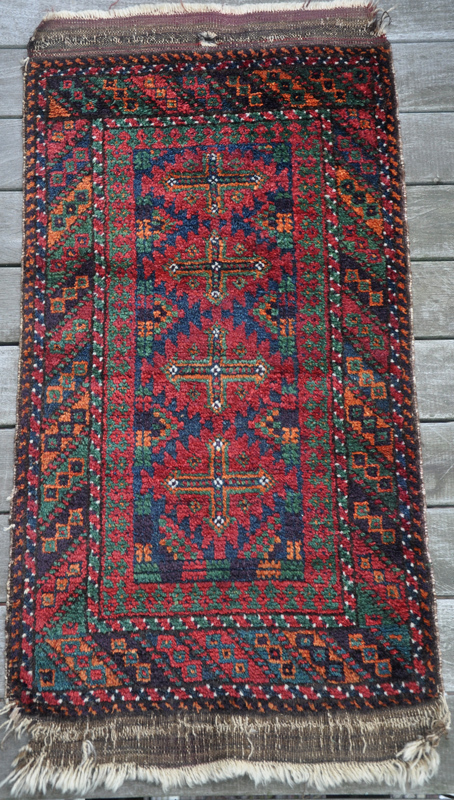 Unlike other 'Baluch' rugs, many are asymmetrically knotted open right (ASR). For the record, this one could be described as common garden variety Arab 'Baluch' from the Ferdows area. It happens to be open left. Note the purple in the kilim end, which is evidently a faded synthetic dye. BTW, I am sure there is more to be said about those cotton-warped herati variants with the boffo borders. I'm glad you've moved that one into the balisht pile, since it fits quite comfortably with a group of balishts generally attributed to Sistan. In fact, if you had pulled it out in 2013, you might have kept the "Seistan Rug" thread going beyond its final 237th post. I am sure there is more to be said about those cotton-warped herati variants with the boffo borders. Yes, but aside from expressing admiration, I don't know that there is anyone who actually knows enough to say it. Yes, that was my implied sub-text. Once again, way too subtle for me, Rich. You really should use your emojis. That's a really sharp one, Marvin.